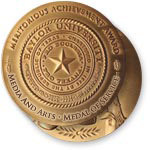 Awarded to an individual whose contributions to the fields of media communications and the arts have made a significant impact on society. First Amendment freedom fighter, caretaker of journalists, preserver of history: these are some of the many hats worn by Charles Overby. As chairman of the Newseum, a 250,000 square foot museum of news located in Washington DC, Charles continues to promote public education on the importance of religious liberty and freedom of speech, press, assembly and petition. Charles worked for years in the news business as a reporter, editor, and executive whose paper The Clarion-Ledger in Jackson, Mississippi won the Pulitzer in 1983. Charles cherishes his Baylor connections, many of them made during his tenure on the University's Board of Regents between 1995 and 2006, and others gained as the proud parent of two Baylor grads. He also feels a sense of pride and optimism about the University's future having heard Baylor President Ken Starr tell the Baylor story in the nation's capitol. Read more about Charles Overby in Baylor Magazine.